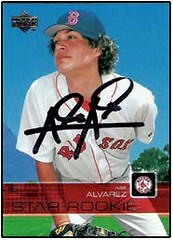 Alvarez: One-Man Uni Watch Bonanza! 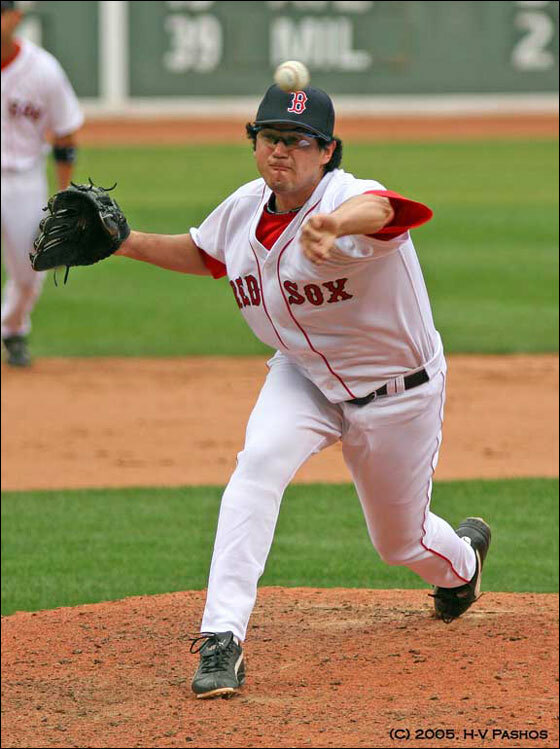 It’s always big uni news when the Red Sox call up pitcher Abe Alvarez, a unique player who’s been riding the Boston/Pawtucket shuttle for several seasons now. 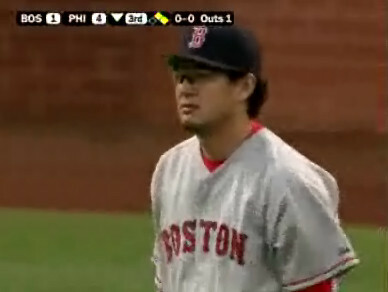 Alvarez, who was called up on Friday and made his 2006 MLB debut yesterday, is still wearing glasses and still has his cap tilted to one side (he does this because he’s legally blind in his left eye; for more on the tilted-cap phenomenon, look here), although his degree of cap rotation appears to be a bit less than in the past. But the new wrinkle is that he’s now wearing stirrups, something he’d previously done in the minors while playing for Portland and Pawtucket, but not during his previous stints in the majors. 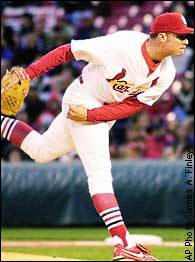 Another Uni Watch favorite made his 2006 debut over the weekend: Anthony Reyes of the Cardinals, who pitched on Saturday and, as usual, had his pants hiked up to reveal his sock stripes. Not sure if he was wearing real stirrups or not, though. Last year, he wore those bogus one-piece socks with a faux stirrup pattern woven in (which is also what Rick Ankiel and Jason Simontacchi have worn in recent years), but in spring training this year Reyes appeared to have genuine stirrups over white sanitaries. 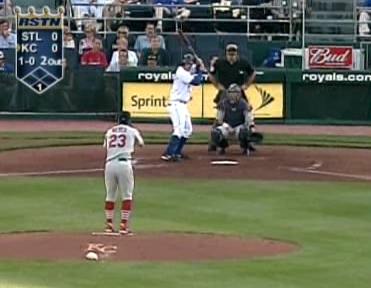 I couldn’t get a clear enough view on MLB.TV’s low-res game video, but I think he had real stirrups on Saturday. Anyone else happen to notice? • The White Sox were supposed to be wearing a 1906 throwback outfit — complete with a henley pullover and a blank cap — for Sunday home games this season. But they didn’t wear the old-school design on Sundays, or on any other day, until yesterday, for their game against the Cubs. Too bad they’re not using blank batting helmets to match the caps (which made for odd scenes like this), and that almost everyone wore their pants down long, which definitely detracts from the look. Still, gotta love the uni numbers. 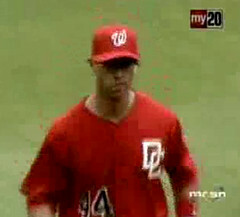 • The Nationals wore their alternate “DC” caps yesterday, but someone forgot to tell Alex Escobar, who wore the team’s script “W” cap. • It’s always weird to see a longtime big-leaguer wearing a minor league uniform during a rehab stint, especially when it’s David Wells. Like, shouldn’t they just let him wear sweatpants and a ratty T-shirt or something? Caps, General, Hosiery, Minor League Baseball, MLB, Typos/Glitches/Wrong Uni/Etc. 24 comments to Alvarez: One-Man Uni Watch Bonanza! Gotta root for Abe Alvarez. He’s the only one in the majors with a reasonable excuse for the loathesome tilted cap deal. 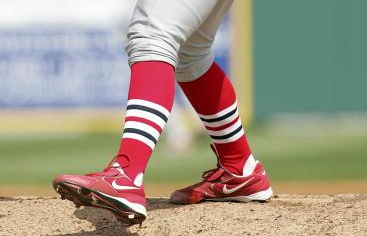 Anyone who wears stirrups is ok with me. Has any baseball team ever had throwback helmets for way-back throwbacks? I know the Brewers do now, but those are very prominent not-too-old throwbacks. When the Twins and Royals dressed up like the Monarchs and Colored Gophers last summer, they wore their regular helmets. Looks like the ChiSox, Pirates, and Indians just did the same thing. As long as were looking at the mismatched helmets, pay attention to the modern undershirts. AJ’s mock turtleneck has the current White Sox font and his sleeves have the hideous dotting. In my book, the modern undershirt is worse than the helmet. When do you think the fashionistas along the Anacostia River will catch on that the Washington Nationals’ straight (no BP jerseys) home and away uniforms, with their block-ish lettering, do not go with their circa 1970s retro ballcap? What do you think will happen in this philosophical regard? Will the uniforms take on a more scriptish look, a la the 1971 Senators, or will the ballcap be more in line with the WASHINGTON / NATIONALS lettering on the jerseys? I’d expect the latter, when the new owners feel that they ‘have’ their audience, and can therefore turn the so-so uniforms of today into Ronald-McDonaldesque, 1970s Pittsburgh Pirates outfits, without fear of alienating their base. This explanation is all I can say about worshipers of the 1970s-1980s Jack Murphy Stadium Padres fans. Or the sunburn-red mistake-by-the-lake Cleveland Indians, also chez 1970s. The throwbacks were great (for the Chicago White Sox) but why couldn’t the Cubs wear a regular (all grey) road uni to at least go along with the program? You know, make it look like two baseball teams were playing? Wearing dark shirts and grey/white/opposite colored pants just looks terrible, like a beer-league softball uniform. But it’s probably done for no other reason than to sell a few more jerseys. After what happened on Saturday, I don’t think the Cubs were too worried about accommodating the Sox in any way — uni-wise or otherwise. Yes. When the White Sox did the “Turn Back the Clock Day” promotion in 1990, they wore helmets to match their uniforms. The caps were white with blue pinstripes & logo and the helmets were solid blue with a white logo. I am positive that they did this, but I can’t find any photographic evidence. Also, in 2001, the Sox wore throwbacks for Sunday home games and I’m pretty sure they did the same thing (white caps, blue helmets). Oops. That was an answer to AMR “Has any baseball team ever had throwback helmets for way-back throwbacks?” but I forgot to include the question. got me thinking… was that the first “throwback” day ever incorporated by MLB.. .I think it was.. in any sport!!! There was a flaw with the White Sox 1906 uniforms. The White Sox wore their usual black socks, at least Podesnik who had his pants up to his knee did. They should have worn white socks/stiruups with the uniform. Here’s the things that bothers me the most, fake stirrups. Thats like putting water in a vodka bottle and taking shots of that all nite long. why couldnÃ¢â‚¬â„¢t the Cubs wear a regular (all grey) road uni to at least go along with the program? Dusty Baker lets the starting pitcher decide what the team will wear. Carlos Zambrano ALWAYS chooses the softball jerseys. This site (might be a weird White Sox-based commercial endeavor…) claims the White Sox were the first to do the Turn Back the Clock promotion. I went to the San Francisco Giants’ first Turn Back the Clock Day in 1991, against the Cubs, when my boys traded in black and orange for red, white, and blue circa-1943 New York Giants duds. The Cubs, of course, refused to wear throwback uniforms. I’m positive it was either this game or this game, because I’m 90% sure Trevor Wilson started for the Giants, and it was during the only season George Bell played for the Cubs. The next day, the SF Chronicle had a picture of Bell, in modern-day dress, taking his lead off of first next to Will Clark, in all his awesome throwback glory. I loves me that Turn Back the Clock Day. The team set up a hand-operated scoreboard in right center at Candlestick, and broadcast nothing over the PA after the game started. It was fantastic. Didn’t Fox or NBC televise a throwback game and throughout the game changed the tv coverage how it actually was…? I think it started out black and white with just 1 camera behind the plate, and worked it’s way throughout the innings to full color and the multiple cameras? That and the throwbacks really make baseball unique. somehow I remember joe buck calling the game… not sure if it was a local FSN telecast, or a fox game…. It wasn’t technically a Turn Back The Clock game. These uniforms are Sunday alternates for the Sox this year — or so it was reported in the off-season. So there wasn’t the need for the Cubs to wear vintage uniforms, or the p.a. to come through a Rudy Vallee megaphone. What drives me crazy is that the bleached white caps don’t match the off-white (natural) uniforms. Either it’s typical New Era, or typical MLB. There’s always the “typical Reinsdorf” issue, but he’s not likely too involved with this operation. I was watching a clip from the Cards game where Pujols hit his 22nd of the year. In the background, i noticed one of the ball boys sitting on a stool and wearing… stirups! If anyone saw the entire game and can validate this just to make sure. Hey Paul, get that picture up here! It was a Saturday afternoon game on FOX. I remember watching it and I enjoyed the progression. I personally thought the best part was the old radio sound that progressed into the modern audio. They should make this a yearly venture (or maybe every couple years, so they don’t kill the novelty). Those White Sox unis were tight. I wish a lot of teams would go back to some of the nicely designed retros, at the very least as their alternate uniform. The White Sox in particular had some amazing designs, esp the World Series uni? which featured red, white and blue stars in the S-O-X. The Cubs blue jerseys are a sporting travesty. It’s time to move on–or at least back to the 70s when powder blue and pinstripes ruled the era: http://imagesource.allposters.com/images/pho/aaft012.jpg. Actually it was much worse than this. The collars were missing from the jerseys – that’s what made them look so “19 century”. Also most sources show the logo and trim as blue, not black. Of course they had no numbers on the backs. I do forgive them for not using authentic wool flannel.